Lucia of Syracuse (283–304), also known as Saint Lucy, or Saint Lucia (Italian: Santa Lucia), was a young Christian martyr who died during the Diocletianic Persecution. 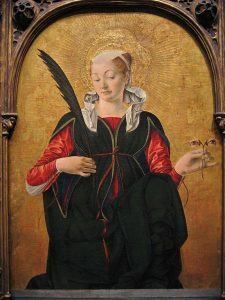 In medieval accounts, Saint Lucy’s eyes are gouged out prior to her execution. She is the patroness of Syracuse in Sicily, Italy, celebrated on December the 13th, Saint Lucy’s day. A special devotion to St. Lucy is practiced also in Verona. “Santa Lucia is coming” is a a very popular and old tradition in Verona. People of all the Verona province are involved in this event. The legend tells that in the XIII century in Verona there was a terrible epidemic of “eyes ache”, especially for kids. People decided to ask for the grace of S. Lucia, with a barefoot pilgrimage up to S. Agnese Church, in the centre of the town (now Barbieri Palace). Kids didn’t want to do that, so parents promised them they will receive many presents from the Saint. Kids accepted and the epidemic ended. Still today, in the night between 12nd and 13th of December, kids in Verona wait for S. Lucia, who bring them presents riding a flying donkey. 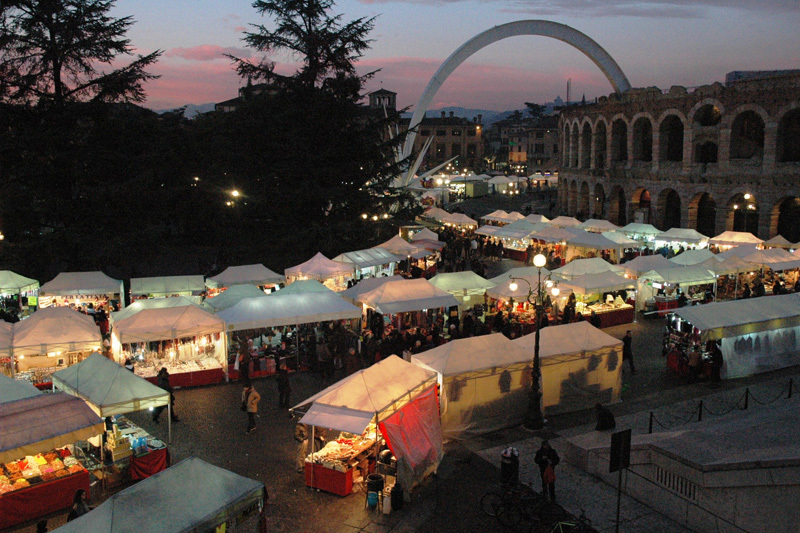 Verona town celebrates the day of S. Lucia with the traditional “Bancheti de Santa Lusia” or Santa Lucia market, in the downtown square Piazza Bra and Via Roma, usually on December 10, 11, 12 and 13. About 250 Stands of street vendors from all over Italy, who exhibit and sell their typical arts and crafts, and provide a unique opportunity to find some special items.